Manufacturers of kitchen appliances are coming out with new sleek and seamless designs for column refrigerators that come in all manner of configurations, sizes, and finishes. They are also more energy efficient than standard refrigeration. With some of the best-known brands releasing their new line of column fridges to appliance warehouses in the coming year, consumers now have more choice in configurations, sizes, and finishes. An older trend of built-in kitchen appliances is becoming new again, as some of the top appliance manufacturers are coming out with their new line of column refrigerators. First released around 15 years ago, column fridges are becoming more and more popular with consumers designing and installing custom kitchens. Instead of stand-alone units, the fridges are incorporated into the wall of the kitchen and are usually integrated with the cabinetry. The ability to flush-mount refrigeration in so many different sizes is what makes column fridges so popular. And that popularity is growing, as more brands are coming out with columns, says Michael Bowman, sales consultant with Genier's Appliances in Vernon, BC. "We are selling more now than ever before, mainly because there are more brands with them in the lineup now… They are quickly becoming the go-to for built-in refrigeration," says Bowman. 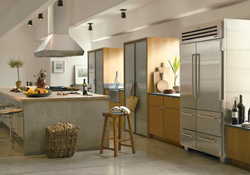 Besides their sleek and seamless design, column fridges are also more energy efficient than traditional refrigeration. "That is a big feature these days with the cost of hydro continually rising," says Bowman. "Every brand of column that we sell is loaded with LED lighting now and that certainly aids with the energy conservation." Buyers are unlimited on how they can incorporate a column fridge into the design of their kitchen. Most come in an option of 18, 24, 30 and 36" widths, says Bowman. "They can be lined up side-by-side in as many units as you want or you can put in an extra fridge in the pantry for the overflow," he says. "They come in all-fridge and/or all-freezer configurations as well as in wine and beverage fridges, and have the ability to be flush mounted, in stainless steel, finish or panel-ready faces." Manufacturers are also offering a range of finishes and color appliances. Jenn-Air appliances has even announced a line of Italian leather finishes for its luxury brand of column refrigerators. "The ability to do an all-stainless steel set up or have the wood panels to match the rest of your cabinets makes columns very attractive," says Bowman. "If you have a fridge, freezer and wine fridge that all match the existing wooden cabinets, it gives your busy kitchen a nice warm feel." Consumers interested in seeing this new line of column refrigerators can visit Genier's massive Vernon appliances showroom. The store offers customers in Kelowna, Kamloops and Vernon refrigerators by Sub-Zero, Fisher & Paykel, Gaggenau, Jenn-Air, Blomberg, and Thermador appliances. "The Jenn-Air column fridges will be released with their Obsidian interior, which is a beautiful black with lots of stainless trim and LED lighting. Gaggenau appliances has their stainless interior as per the rest of their refrigeration line up," says Bowman. While Genier's does not install the column refrigerators itself, the store can recommend professionally trained installers to its customers. Genier's has been helping Okanagan homeowners take care of their families with the finest home and kitchen appliances for more than 50 years. Their appliances showroom houses close to 60 of the world's best brands and more selection than any other store in the BC Interior, including Kamloops and Kelowna appliances stores.